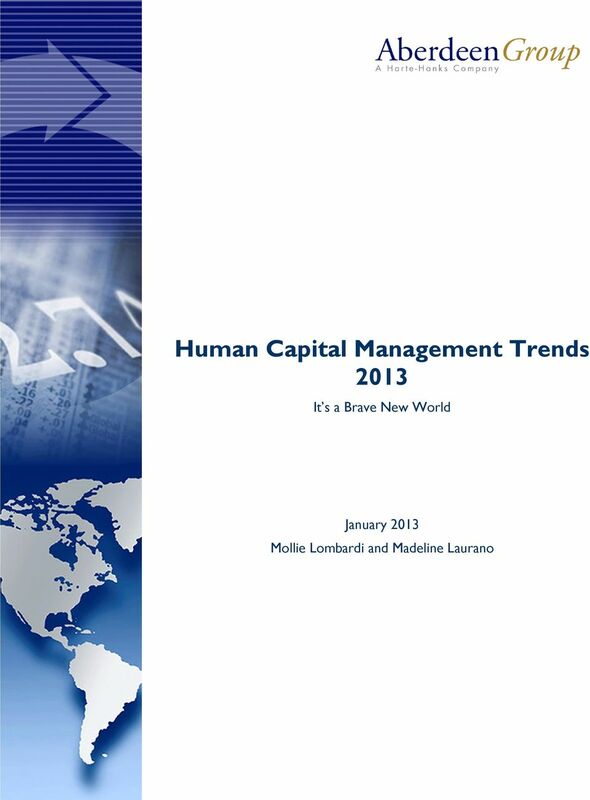 Download "Human Capital Management Trends 2013"
2 Page 2 Executive Summary Human capital management is a key business initiative. Without insight into workforce and talent needs, organizational performance suffers. Aberdeen's Human Capital Management (HCM) research has continually shown that in order to meet business challenges, grow the organization, and keep customers happy, the right talent must be hired, retained, deployed, developed, and engaged. This study of 253 organizations, conducted in November and December 2012, looks at the key strategies, technologies, and capabilities deployed by Best-in-Class HR and talent management practitioners, and the positive impact those activities have on business performance. Research Benchmark Aberdeen s Research Benchmarks provide an in-depth and comprehensive look into process, procedure, methodologies, and technologies with best practice identification and actionable recommendations Best-in-Class Performance Aberdeen used the following three key performance criteria to distinguish Best-in-Class companies for Human Capital Management: 1. 85% of employees rated themselves as highly engaged in their most recent engagement survey 2. 74% of key positions have a ready and willing successor identified 3. 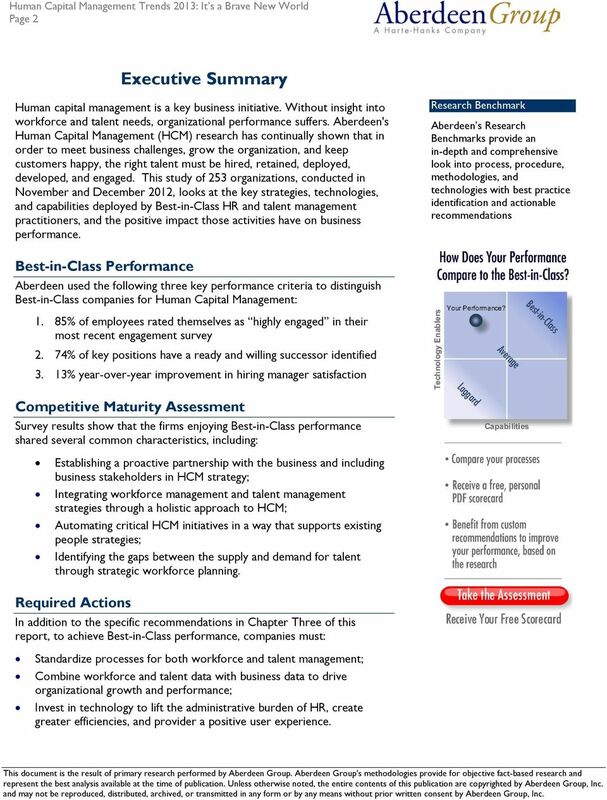 13% year-over-year improvement in hiring manager satisfaction Competitive Maturity Assessment Survey results show that the firms enjoying Best-in-Class performance shared several common characteristics, including: Establishing a proactive partnership with the business and including business stakeholders in HCM strategy; Integrating workforce management and talent management strategies through a holistic approach to HCM; Automating critical HCM initiatives in a way that supports existing people strategies; Identifying the gaps between the supply and demand for talent through strategic workforce planning. Required Actions In addition to the specific recommendations in Chapter Three of this report, to achieve Best-in-Class performance, companies must: Standardize processes for both workforce and talent management; Combine workforce and talent data with business data to drive organizational growth and performance; Invest in technology to lift the administrative burden of HR, create greater efficiencies, and provider a positive user experience. This document 2013 Aberdeen is the result Group. of primary research performed by Aberdeen Group. Aberdeen Group's methodologies provide for Telephone: objective fact-based research 5200 and represent the best analysis available at the time of publication. Unless otherwise noted, the entire contents of this publication are copyrighted Fax: 617 by Aberdeen Group, Inc. and may not be reproduced, distributed, archived, or transmitted in any form or by any means without prior written consent by Aberdeen Group, Inc.
4 Page 4 Chapter One: Benchmarking the Best-in-Class Business Context As business evolves, most HR departments have undergone a seismic shift. No longer viewed as a back-office function, HR now plays a critical role in organizational growth, performance, and profitability. As a result, Human Capital Management professionals must adopt a new set of skills focused on driving business outcomes and balancing two very different and often contradictory personas. On one hand, they are required to focus on relationship-building initiatives by navigating through complex organizational hierarchies and bridging the gap between employer and employee. Meanwhile, they must behave as finance professionals by measuring and monitoring workforce and talent initiatives with an understanding of the impact to the bottom line. While 55% of organizations believe that HCM professionals have succeeded in making HR more strategic to the business, many companies still have a long way to go. Aligning HR and business objectives presents several challenges, particularly in a time of economic uncertainty and increased competition. According to Aberdeen s 2013 HCM Trends survey, organizations that overcome these obstacles are able to plan for future talent needs, integrate workforce and talent initiatives, and leverage innovative technology solutions. The following pages of this report will outline how some of today s leading companies design, implement, and measure a successful Human Capital Management strategy. Fast Facts 55% of organizations believe that HR has become more strategic over the past year The Business of HCM Most organizations are unclear about the future of today s economy and its impact on organizational growth. This uncertainty forces them to make leaner and smarter decisions particularly around talent. As a result, the top pressure facing HCM professionals today is the need to operate more efficiently in today s economic climate (41%). For many organizations, increased efficiency will not only improve processes but will enable them to continuously outperform competitors. In addition, organizations cited organic growth (32%) and the scarcity of key skills (30%) as top pressures (see Figure 1). Understandably, organizations looking to gain competitive advantage must move outside of their comfort zones and expand their footprint in new geographies, markets, and industries. As these organizations grow, the shortage of key skills is often exacerbated. 6 Page 6 example, in Aberdeen s 2012 Strategic Talent Acquisition: Are You Prepared to Hire the Best report, over 50% of organizations are moving away from Job Boards. Performance Management: One component of performance management that has created much debate is the topic of performance reviews. For many organizations, they are either inconsistent or ineffectual. While some organizations have eradicated standard reviews, others are finding a more innovative and engaging way to conduct reviews that relies on peer-to-peer feedback and stronger communication. Learning and Development: Organizations today are looking to create a culture around learning and development. As a result, both formal and informal learning are deeply ingrained in any successful talent management strategy. As this report will show, these challenges around human capital management are not insurmountable. Organizations have achieved dramatic gains not only in their ability to create a clearly defined strategy but in their ability to measure results. 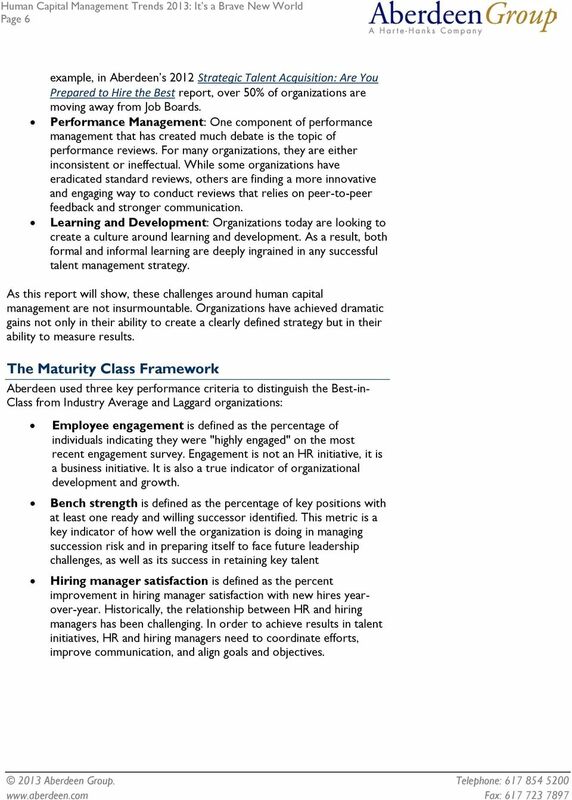 The Maturity Class Framework Aberdeen used three key performance criteria to distinguish the Best-in- Class from Industry Average and Laggard organizations: Employee engagement is defined as the percentage of individuals indicating they were "highly engaged" on the most recent engagement survey. Engagement is not an HR initiative, it is a business initiative. It is also a true indicator of organizational development and growth. Bench strength is defined as the percentage of key positions with at least one ready and willing successor identified. This metric is a key indicator of how well the organization is doing in managing succession risk and in preparing itself to face future leadership challenges, as well as its success in retaining key talent Hiring manager satisfaction is defined as the percent improvement in hiring manager satisfaction with new hires yearover-year. Historically, the relationship between HR and hiring managers has been challenging. In order to achieve results in talent initiatives, HR and hiring managers need to coordinate efforts, improve communication, and align goals and objectives. 9 Page 9 these metrics significantly more than Industry Average or Laggard organizations (see Figure 4). The following pages will highlight some of the critical components to consider when rolling out a human capital management strategy and driving business results. 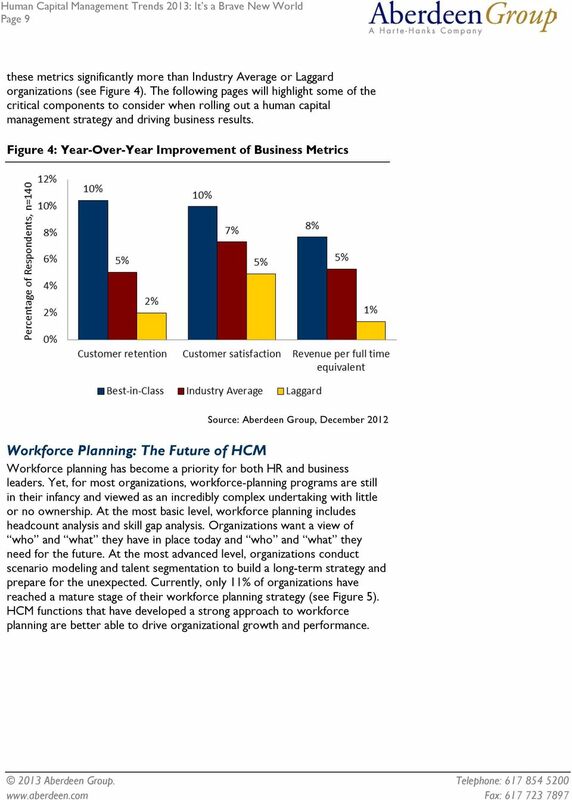 Figure 4: Year-Over-Year Improvement of Business Metrics Workforce Planning: The Future of HCM Workforce planning has become a priority for both HR and business leaders. Yet, for most organizations, workforce-planning programs are still in their infancy and viewed as an incredibly complex undertaking with little or no ownership. At the most basic level, workforce planning includes headcount analysis and skill gap analysis. Organizations want a view of who and what they have in place today and who and what they need for the future. At the most advanced level, organizations conduct scenario modeling and talent segmentation to build a long-term strategy and prepare for the unexpected. Currently, only 11% of organizations have reached a mature stage of their workforce planning strategy (see Figure 5). HCM functions that have developed a strong approach to workforce planning are better able to drive organizational growth and performance. 10 Page 10 Figure 5: Current Workforce Planning Strategies HR and Finance: An Unlikely Marriage The integration and linkage of financial and HR data will provide organizations with the visibility into, and control over, their financial performance, as well as the talent available to execute on business strategy. Additionally, particularly in workforce management processes such as payroll, there is an overlap between the role of finance and HR. Yet, for many organizations, this integration between financial and HR data is not in place creating inefficiencies and inaccuracies. When financial leaders were asked to identify the most important driver of unified data and analytics in Aberdeen s upcoming Business Analytics study, the most commonly cited reason was the need to improve overall productivity (48% of respondents). Productivity is a measure that by its very nature requires a unified view of labor output, financial performance, and the movement of goods or services through the organization. The finance organization cannot hope to address productivity issues without moving towards a unified view of HR and financial data. Unified financial and HR data is important because of its ability to power analytics and decision making. Currently, 56% of Best-in-Class organizations combine talent management data with business data compared to 23% of Industry Average and 11% of Laggard organizations. 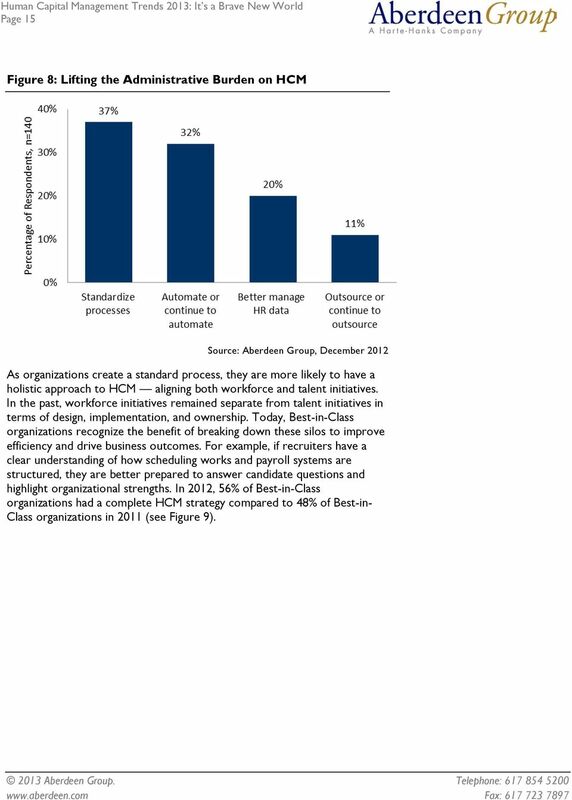 Additionally, 51% of Best-in-Class organizations combine workforce management data with business data compared to 24% of Industry Average organizations and 19% of Laggard organizations (Figure 6). 12 Page 12 Aberdeen Insights Career Development: The Untapped Area of Human Capital Management tools. In 2012, 20% of organizations invested in career development tools and 20% plan to invest in these tools over the next 12 months (see Figure 7). 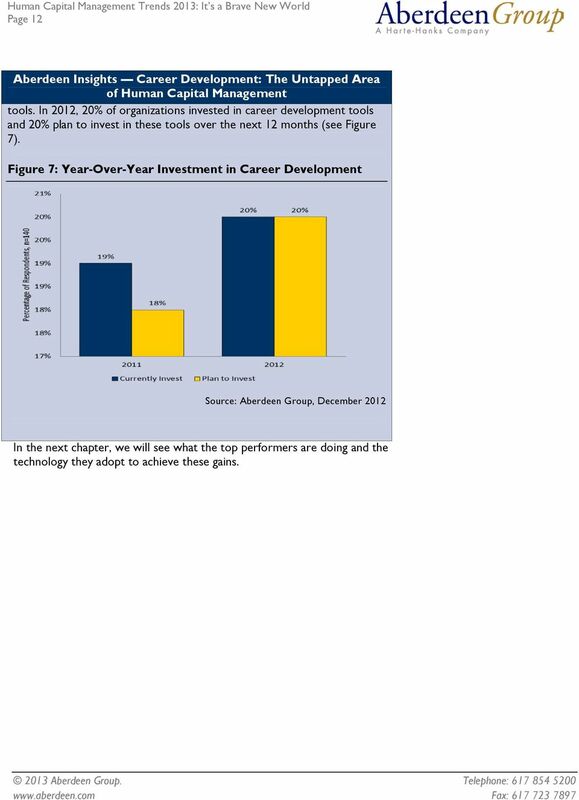 Figure 7: Year-Over-Year Investment in Career Development In the next chapter, we will see what the top performers are doing and the technology they adopt to achieve these gains. 14 Page 14 Performance Best-in-Class Average Laggards Clearly defined metrics are in place for measuring HCM effectiveness 41% 18% 12% Employee feedback is leveraged to make HCM decisions 47% 25% 22% Source: Aberdeen Group, December2012 Capabilities and Enablers Based on the findings of the Competitive Framework and interviews with end users, Aberdeen s analysis of the Best-in-Class indicates that the following factors are critical to success: Standardize processes for both workforce management and talent management; Combine workforce and talent data with business data to drive organizational growth and performance; Invest in technology to lift the administrative burden of HR, create greater efficiencies, and provider a positive user experience. Process In human capital management, organizations should be able to provide a clear picture of workforce and talent initiatives to any stakeholder at any time. In order to achieve this goal, HCM needs to be consistent throughout the entire organization. When asked how organizations reduce the tactical burden placed on HR, the top response was to standardize processes (see Figure 8) over automation and outsourcing. By standardizing processes, 45% of Best-in-Class organizations have consistency in their HCM strategy across the organization compared to 34% of Industry Average organizations and 26% of Laggard organizations. 15 Page 15 Figure 8: Lifting the Administrative Burden on HCM As organizations create a standard process, they are more likely to have a holistic approach to HCM aligning both workforce and talent initiatives. In the past, workforce initiatives remained separate from talent initiatives in terms of design, implementation, and ownership. Today, Best-in-Class organizations recognize the benefit of breaking down these silos to improve efficiency and drive business outcomes. For example, if recruiters have a clear understanding of how scheduling works and payroll systems are structured, they are better prepared to answer candidate questions and highlight organizational strengths. 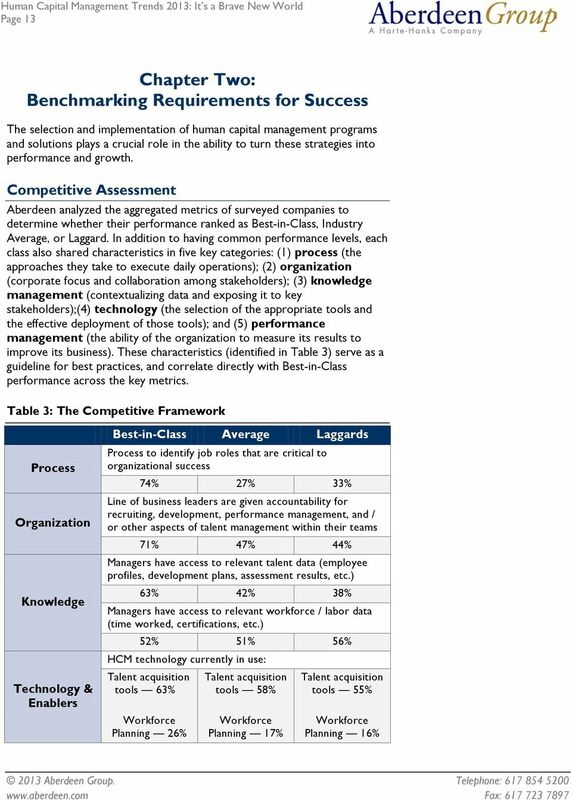 In 2012, 56% of Best-in-Class organizations had a complete HCM strategy compared to 48% of Best-in- Class organizations in 2011 (see Figure 9). 17 Page 17 inefficiencies. According to Aberdeen s research, Best-in-Class organizations are more likely to provide managers with access to both workforce and talent data. 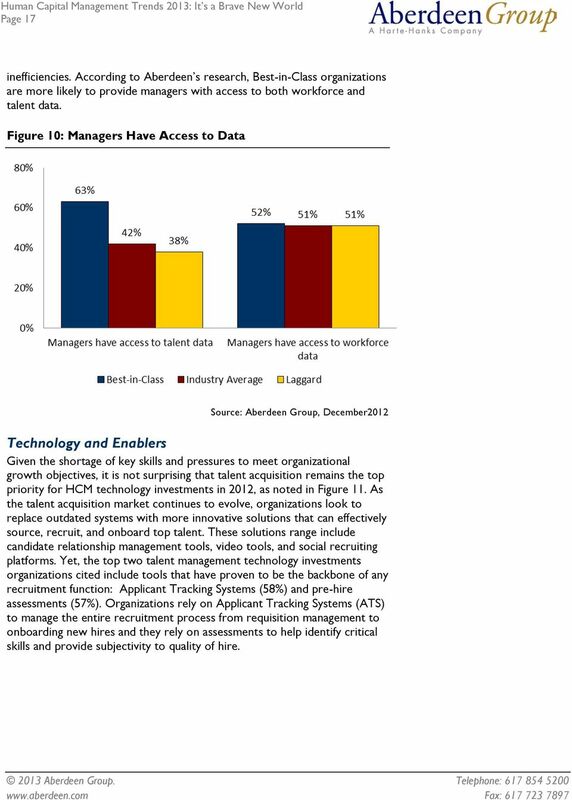 Figure 10: Managers Have Access to Data Source: Aberdeen Group, December2012 Technology and Enablers Given the shortage of key skills and pressures to meet organizational growth objectives, it is not surprising that talent acquisition remains the top priority for HCM technology investments in 2012, as noted in Figure 11. As the talent acquisition market continues to evolve, organizations look to replace outdated systems with more innovative solutions that can effectively source, recruit, and onboard top talent. These solutions range include candidate relationship management tools, video tools, and social recruiting platforms. Yet, the top two talent management technology investments organizations cited include tools that have proven to be the backbone of any recruitment function: Applicant Tracking Systems (58%) and pre-hire assessments (57%). Organizations rely on Applicant Tracking Systems (ATS) to manage the entire recruitment process from requisition management to onboarding new hires and they rely on assessments to help identify critical skills and provide subjectivity to quality of hire. 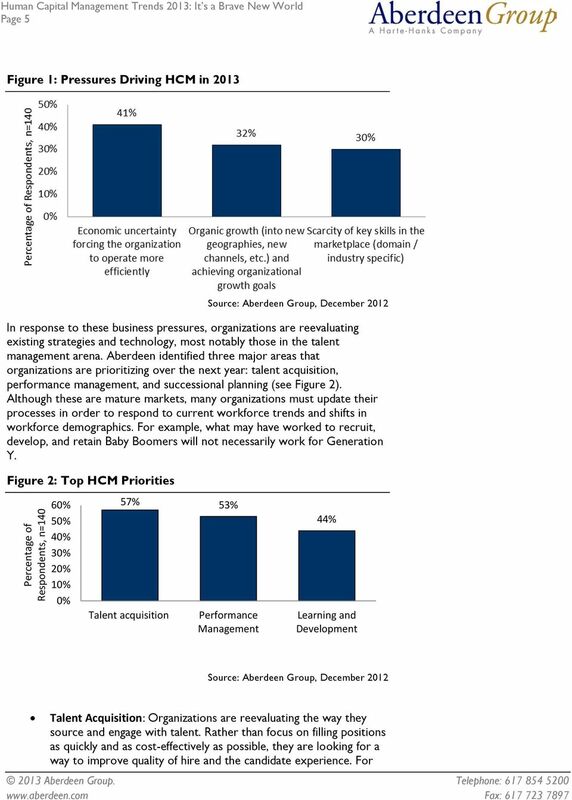 18 Page 18 Figure 11: Top Priorities for HCM Technology In workforce management, the top priorities are in areas that are both traditional areas of workforce management (Human Resource Information Systems (HRIS)) and areas that have matured with mobile and tablet solutions (time and attendance). Employee self-service is also an area that is gaining momentum. 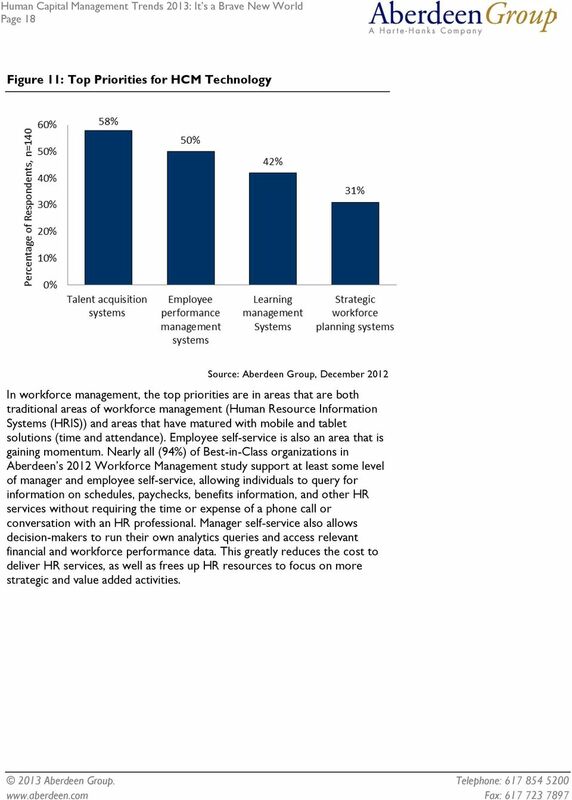 Nearly all (94%) of Best-in-Class organizations in Aberdeen s 2012 Workforce Management study support at least some level of manager and employee self-service, allowing individuals to query for information on schedules, paychecks, benefits information, and other HR services without requiring the time or expense of a phone call or conversation with an HR professional. Manager self-service also allows decision-makers to run their own analytics queries and access relevant financial and workforce performance data. This greatly reduces the cost to deliver HR services, as well as frees up HR resources to focus on more strategic and value added activities. 19 Page 19 Figure 12: Workforce Management Technology in Place Performance Management Before organizations can evaluate the benefit of their HCM initiatives, they need to define key metrics. Surprisingly few organizations, including high-performing companies, have defined metrics in place. 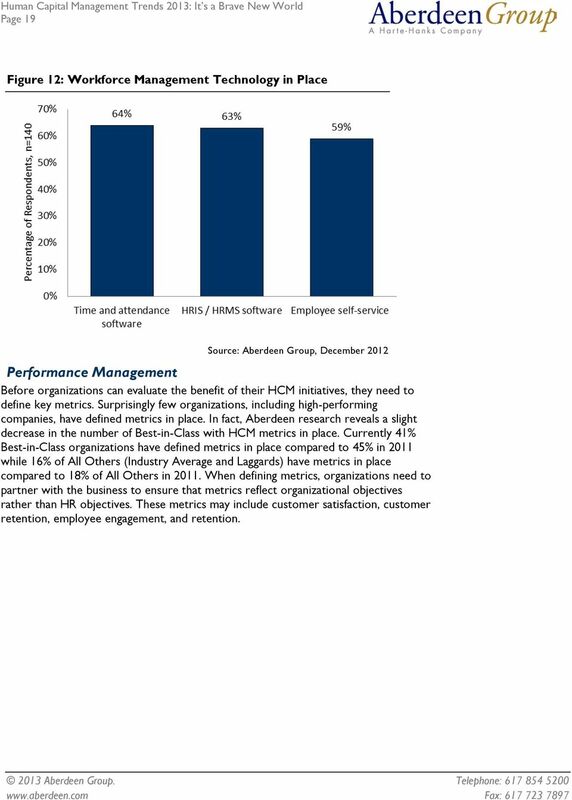 In fact, Aberdeen research reveals a slight decrease in the number of Best-in-Class with HCM metrics in place. Currently 41% Best-in-Class organizations have defined metrics in place compared to 45% in 2011 while 16% of All Others (Industry Average and Laggards) have metrics in place compared to 18% of All Others in When defining metrics, organizations need to partner with the business to ensure that metrics reflect organizational objectives rather than HR objectives. These metrics may include customer satisfaction, customer retention, employee engagement, and retention. 21 Page 21 Chapter Three: Required Actions Whether a company is trying to move its performance in Human Capital Management from Laggard to Industry Average, or Industry Average to Best-in-Class, the following actions will help spur the necessary performance improvements: Laggard Steps to Success Align HCM with Business Objectives: In order to achieve business impact, HR and talent strategy must be in concert with business strategy. This starts by making sure business stakeholders are involved so that alignment occurs from the outset. Currently just 34% of Laggards involve business stakeholders in HCM strategy setting and execution, making them just under half as likely as Bestin-Class organizations (73%). Rethink Existing Talent Management Strategies: Although these are mature markets, many organizations must update their processes in order to respond to current workforce trends and shifts in workforce demographics. For example, what may have worked to recruit, develop and retain Baby Boomers, will not necessarily work for Generation Y. Standardize Processes: HCM needs to be consistent in workforce and talent processes throughout the entire organization. By standardizing processes, organizations have consistency in their HCM strategy across the organizations. 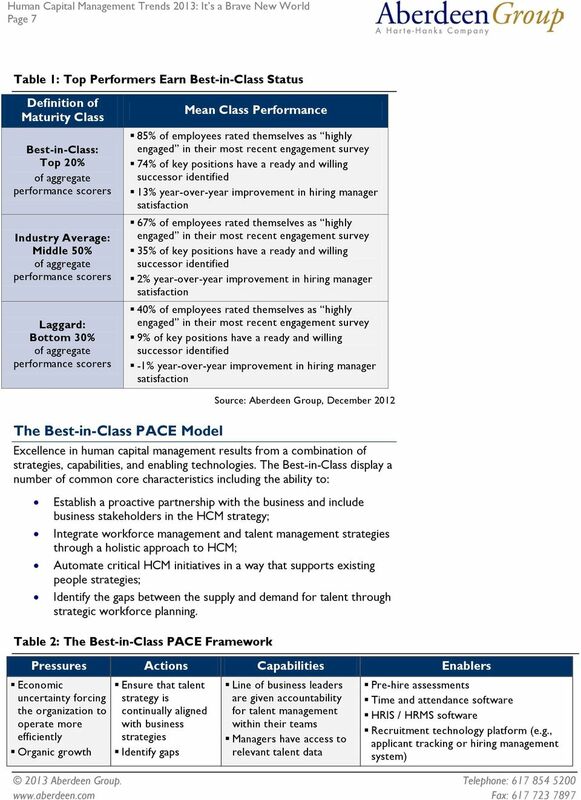 Only 22% of Laggard organizations have consistency in HCM strategies compared to 52% of Best-in-Class. Fast Facts Currently just 34% of Laggards involve business stakeholders in HCM strategy setting and execution, making them just under half as likely as Bestin-Class organizations (73%). Industry Average Steps to Success Invest in Strategic Workforce Planning: Workforce planning has become a priority for both HR and business leaders. Yet, for most organizations, workforce planning programs are still in their infancy and viewed as an incredibly complex undertaking with little or no ownership. Currently, only 10% of organizations have reached a mature stage of their workforce planning strategy. Unify Finance and Talent Data: The integration and linkage of financial and HR data will provide organizations with the visibility into, and control over, their financial performance, as well as the talent available to execute on business strategy. Unified financial and HR data is important because of its ability to power analytics and decision making. Currently only 20% of the Industry Average combine talent management with business data, compared to 46% of Best-in-Class organizations. Helping our clients win in the changing world of work: Recruitment Process: Why Outsource? A Manpower Insights Paper The future of RPO looks strong despite or perhaps aided by the current global recession. 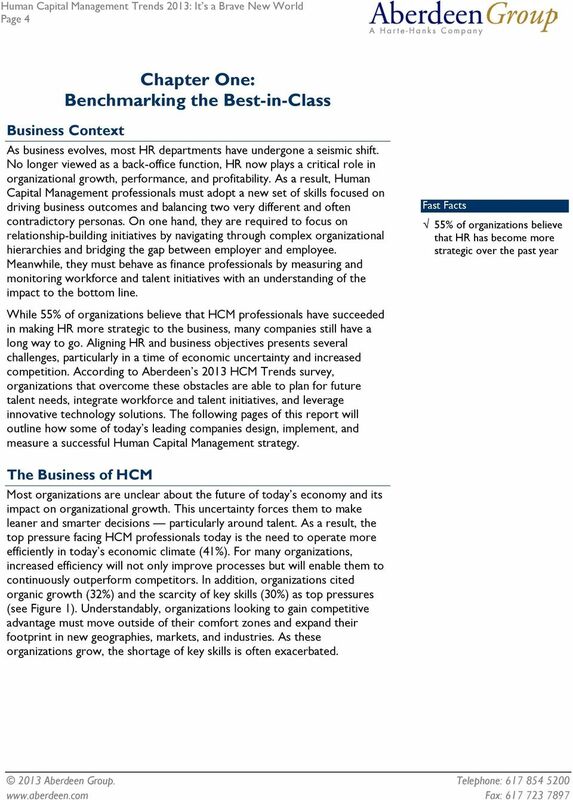 Human Capital Advantage for Business What is the value of ADP ihcm for HR Directors? Human Capital Advantage for Business What is the Value of ADP ihcm for CEOs? Streamlining Sales and Use Tax Management June 2011 William Jan Page 2 Executive Summary Being exposed to government tax audits and having to deal with fines and penalties are issues that companies fear.